Jeffrey Heer is an Associate Professor of Computer Science and Engineering at the University of Washington. His work focuses on social computing, human-computer interaction and interactive visualization particularly in relation to large data collections with the aim of developing novel interactive systems for visual analysis and communication. His lab has developed numerous visualization tools (D3, Protovis, Flare, Prefuse) which are widely used by the research community, companies and thousands of data enthusiasts around the world. 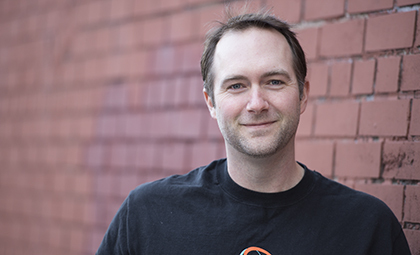 Jeff is the recipient of a Sloan Research Fellowship, an ACM UIST Notable Paper Award, and a Technology Review TR35 Award for the top innovators under the age of 35. 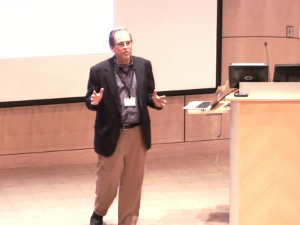 He will deliver the opening VIZBI 2014 keynote on on Data Visualization Principles. 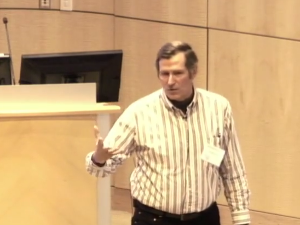 The videos of talks from VIZBI 2013 final session on ‘Alignments & Phylogenetics” are now available on http://vizbi.org/videos/. 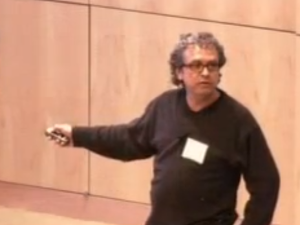 Bruno Sobral talks about development and deployment of cyberinfrastructure supporting infectious disease research. Bruno demonstrates how collaboration with the bench scientists to learn about their needs, uses and challenges can lead to design of more effective resources for data exploration and analysis. He emphasises the importance of designing in a user-centric manner and highlights the importance of human-computer interface professionals in the design process. 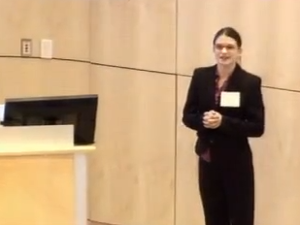 Susannah Tringe talks about metagenomics analysis tools and the challenges of gaining a systems-level understanding of a microbial community. 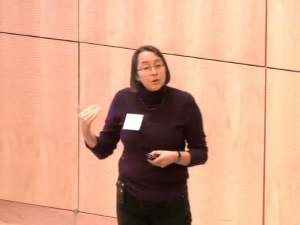 She notes that there are some good analysis tools available for analysis at the 16S sequence and unassembled metagenome level, but acknowledges that more effort into analysis and visualisation solutions are required at the microbial community and ecosystem level. In the final talk, Daniel Janies showcases SupraMap, a web-based app that integrates genetic sequences of pathogens with geographic data points to map the spread of diseases and track mutations. 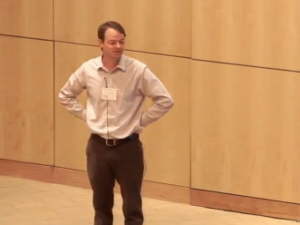 The videos from the ‘Vizualizing Organism Data’ session of VIZBI 2013 are now available on http://vizbi.org/videos. Sean Megason gives the opening talk which focuses on visualisation challenges of in toto imaging in developmental biology. 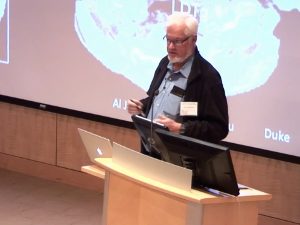 Mark Henkelman then talks about how imaging of randomly or targeted mutagenized mice can be used to look for phenotypes that represent human diseases. Finally, Daniel Haehn talks about visualising medical and scientific data in 3D (such as MRI and CT scans, microscopy scan stacks etc.) and introduces some of the open-source tools available. 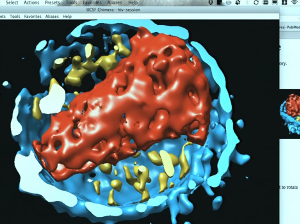 ‘Visualising Cellular Systems’ is the topic of the fourth session of VIZBI 2013 and the session videos can be found on http://vizbi.org/videos. The first talk is by Martin Miller who speaks about data visualisation in proteomics. Scooter Morris then gives an introduction into visualising biological networks and a primer on the features of Cytoscape, an open source platform for integration and visualization of biological data. 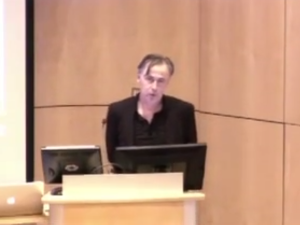 Finally, Peter Sorger and Bang Wong talk about the challenges of visualisation of large sets of multidimensional data such as single-cell imaging data, multiplex biochemistry, dose-response assays and drug polypharmacy among others. A week after the VIZBI 2014, on March 10-11, EMBL Advanced Course ‘Cytoscape Developer’ will be held at EMBL Heidelberg. This two-day course will teach participants to develop Apps for the Cytoscape 3.x series. 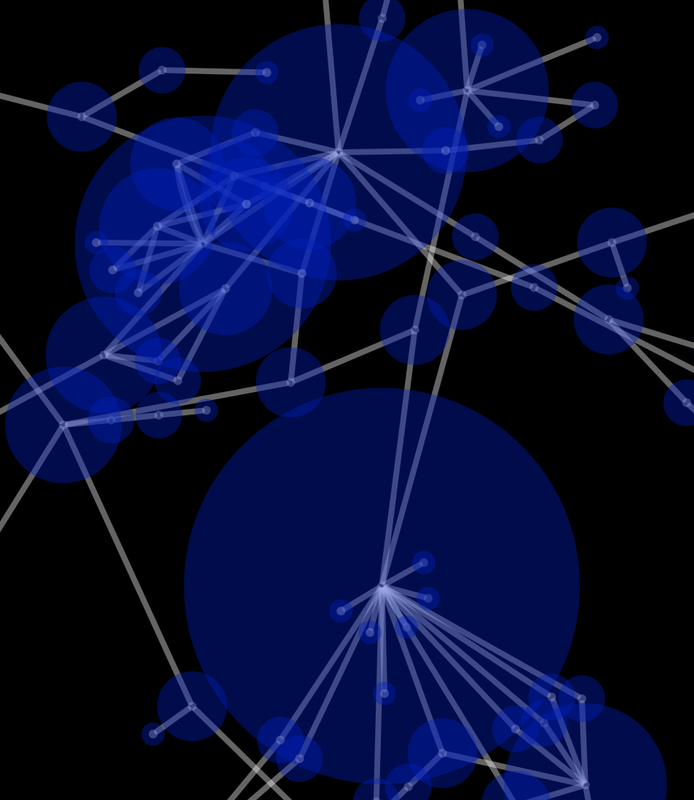 Cytoscape is an open source software platform for visualisation of molecular networks and biological pathways. The system allows annotation and integration of these networks with gene expression profiles and other state data. 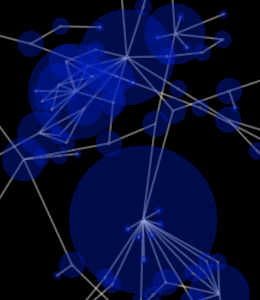 While Cytoscape was initially built for biologists, the platform can be adapted to a broad range of network-related projects including bioinformatics, social network analysis and semantic web. Cytoscape has a very active App developer community which means that new functionalities and tailored solutions are constantly being added to the platform. As part of the course, the participants will be introduced to the app development process as well as the key aspects of the Cytoscape API necessary to manipulate Cytoscape tables, networks, and user interface. The participants will then be guided on how to set up development environments on multiple platforms, and develop an initial Cytoscape App. The second day of this course will provide time for each participant to interact with the instructor and other participants to plan and develop their own Cytoscape app. The registration is now open until Friday 31 January 2014. Please register here. 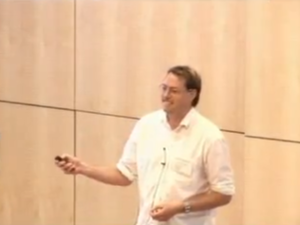 The video recordings of the talks from the ‘Visualising Cellular Systems’ session of VIZBI 2013 are now available on http://vizbi.org/videos. In the opening talk, Seán O’Donoghue talks about molecular spatial data and the emerging issue of sequence-structure gap arising from experimental difficulties in obtaining reliable (or any) structure information for a given protein. 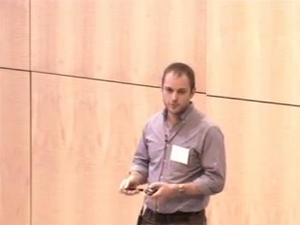 In his talk, Seán gives a brief demonstration of Aquaria, a web-based 3D molecular structure visualization tool that combines data from various databases and allows investigators to easily view and explore proteins and protein-protein interactions. Thomas Ferrin talks about visualization tools for interactive modelling of biological structures and showcases how various features Chimera, an extensible molecular modelling software, can be applied to visualise various protein structures. The third talk, given by Ian Sillitoe, introduces protein structure classification with particular emphasis on superfamily-centric taxonomy which is used in the CATH database. 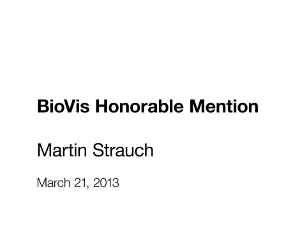 Finally, Martin Strauch briefly presents his BioVis Honorable Mention paper on visualising odours with insect brains. 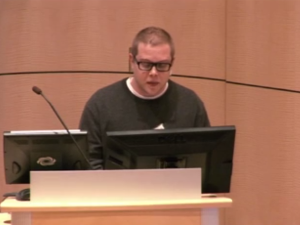 The videos from the second VIZBI 2013 session focusing on visualisation of transcript data are now available at http://vizbi.org/videos. The first talk by Paul Gardner is focusing on the challenges of visualising RNA structures and alignments with particular emphasis on Rfam database, a collection of non-coding RNAs, structured cis-regulatory elements and self-splicing RNAs. The topic or data reliability and co-relation of anti-sense RNA sequences is then discussed by Gisela Storz. She demonstrates that RNA-seq data across different experiments and from various sources can often be riddled with discrepancies and lack of overlap. She argues that, while the majority of RNA-seq data is robust and reliable, low abundance transcripts can be difficult to account for and the variations in experimental as well as computational conditions can lead to vastly different data. 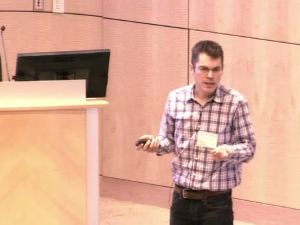 In the final talk of the session, Cole Trapnell talks about isoform-resolution analysis of RNA-seq. RNA-seq is an assay used to determine the abundance of RNA transcripts in a transcriptome, the results of which can be used for gene discovery and expression analysis. Cole highlights the inherent challenges associated with the analysis of isoform-resolution data and proposes several different areas that are open for improvement. 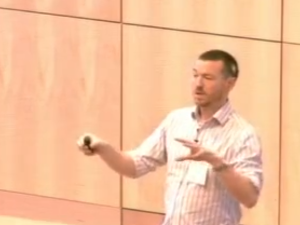 As promised, the videos from the first VIZBI 2013 session are now available at http://vizbi.org/videos. The session’s topic is Genome Browsers and the rising challenges of epigenomic and genomic data visualization. 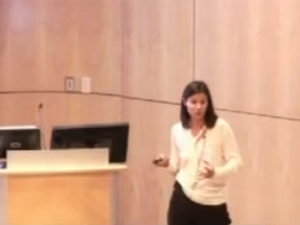 Ester Rheinbay gives a great introduction into the epigenetics and the current tools available for the visualization of epigenomic data including the UCSC Genome Browser. As the amount and complexity of epigenomic data increases it becomes increasingly challenging to navigate and explore the vast data sets. 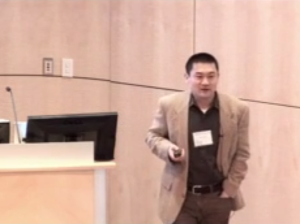 Ting Wang took the challenges raised during the VIZBI 2011 meeting and set out to address them in the WashU Epigenome Browser, which he showcases during his talk. Jim Zheng talks about the importance of understanding the 3D structure of genome and gives an introduction into Genome3D framework which allows integration of multi-scale structural and genomic data within 3D. 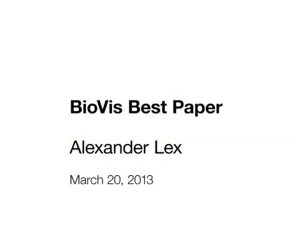 The final talk of the session is presented by Alexander Lex, the winner of the BioVis 2012 Best Paper award. Alex introduces enRoute, a visualization technique that enables detailed analysis of complex data sets in the context of biological pathways.